tty, like Turner, did not enjoy even the advantages of an ordinary education. His art education, on leaving the printing-ofﬁce at York, was pursued at the Royal Academy. The greater part of his life was passed in the Life School of the Royal Academy. The transference of the human ﬁgure to canvas was the only aim and end of his existence. There never was a more diligent student. In July, 1830, he went to Paris, the Schools of the Royal Academy being closed. To avoid interruption of his studies, he entered the studio of M. Hersen, at distinguished artist. Upon his first attendance, he immediately commenced to paint. This was contrary to French custom. In the course of the morning, Hersent, on going round to [53/54] inspect the works of the students, stopped behind his new English pupil "Oh!" he exclaimed, "this will never do, you must spend the whole of the ﬁrst day in drawing an accurate outline." Etty made no reply. He never returned to the studio. 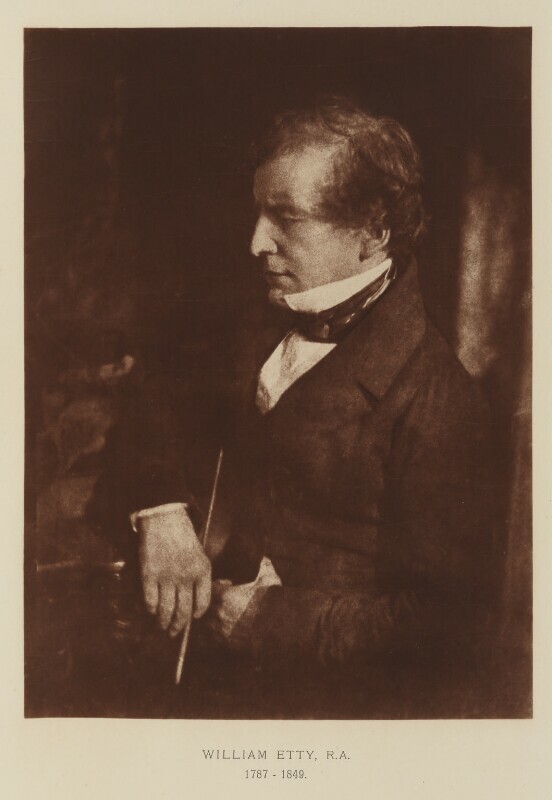 William Etty, after David Octavius Hill, and Robert Adamson, © National Portrait Gallery, NPG Ax29503 (on the Creative Commons CC BY-NC-ND 3.0 licence). On the removal of the Royal Academy to Trafalgar Square, he used to attend the Life School, and although afflicted with asthma, he toiled nightly up the many steps to the dome, in which the model was posed. There he would spend an hour, and then go to a Life Academy in St. Martin's Lane, and there work another hour. He would then go to his apartments, which were at the top of a house at the righthand end of Buckingham Street, Strand. Sometimes Etty would come up to me upon leaving the School, and ejaculate "Tea at nine." This was an invitation to meet at his lodgings a few favourite students, to discuss "Bohemian Muffins." He made the tea with a considerable amount of ceremony. The teapot and kettle were sacred. He was the high priest of the evening. No one dared to touch the pot or kettle. The infusion was always a success. The meetings were genial. [55/56] He took small part in the conversation. He listened with attention, having a keen relish for any joke that might pass. The inexpensive entertainment was always agreeable. Sometimes Etty might be seen in the pit of the Coburg, afterwards the Victoria, Theatre. Many times I have returned with him, discussing the merits of that which we had seen. To the Life School, Etty used to take millhoard prepared with size. Upon this he hastily drew an outline with white chalk. He then removed a portion of this, which might interfere with the subsequent process, and made another outline with Indian ink, which was absorbed by the board. When this was dry, he passed a thin coat of a mixture containing equal parts of cold drawn linseed oil, sugar of lead, and water, well shaken together, mixed up with his colours. This process enabled him to resume his work, which was quite dry, on the following day. It was attended with disadvantages. After a lapse of time, the surface of the painting begins to effloresce, leaving a coating of white powder. This could easily be removed by a sponge, but, however often removed, it [55/56] always reappeared, accompanied by a dull and chilled look, even when it had been varnished. He, in consequence of the result, gave up the practice. With a carefully prepared palette, with colours enough for two hours, he worked on until he produced a confused dirty mixture. He used up every particle on his study, which was brilliant and clear, when ﬁnished. Etty, when visitor in the Life School, introduced objects to form backgrounds, to set off the select points of the mode]. Sometimes it was a large piece of maroon velvet, on which the female reclined. At other times, he placed a large golden ewer near, and then exotics with other accessories. His brother academicians did not agree with him. They thought that the student's attention was distracted from the more serious study, and that he was encouraged to try picture making, when his time should have been given to the human ﬁgure. A female model told me, that, once in Etty's absence, observing the unusually rough surface of some parts of his picture, she removed the projecting lumps of colour. She told her husband that "Etty was a nasty [56/57] beast, for he could not paint smooth." The painter, it seems, did not discover that another had been engaged on his work. Etty was the ﬁrst to encourage me to exhibit at the Academy. He upbraided me for sending to the [Society of] British Artists. I explained that, like actors who ﬁrst feel their way at minor theatres, I exhibited at Suffolk Street, where my productions might help by way of variety, and be useful, instead of running the risk of being rejected by the Royal Academy, or being badly placed. When at length I sent, and my works were received, Etty observed to me: "Did I not give you good advice, you now see how right I was?" Hart, Solomon. Reminiscences of Solomon Hart. Ed. Alexander Brodie. London: Wyman & Sons, 1882. 53-57.